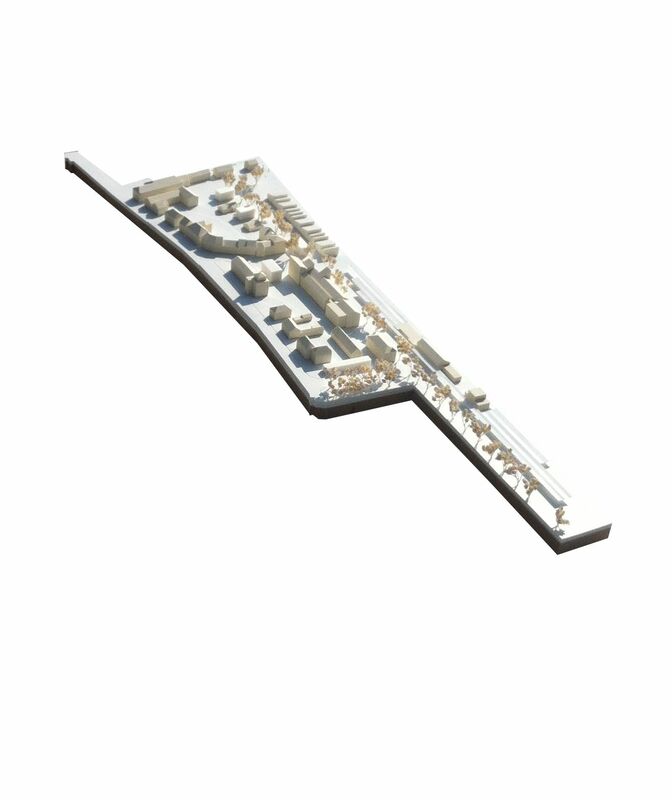 Our proposal for the construction of the new Weilheim Station Bus Terminal and the redevelopment of the Railway Station Area aims to redefine the whole Station Area, providing a cohesive identity to all the transport infrastructures converging on the site, with a very minimal amount of resources. 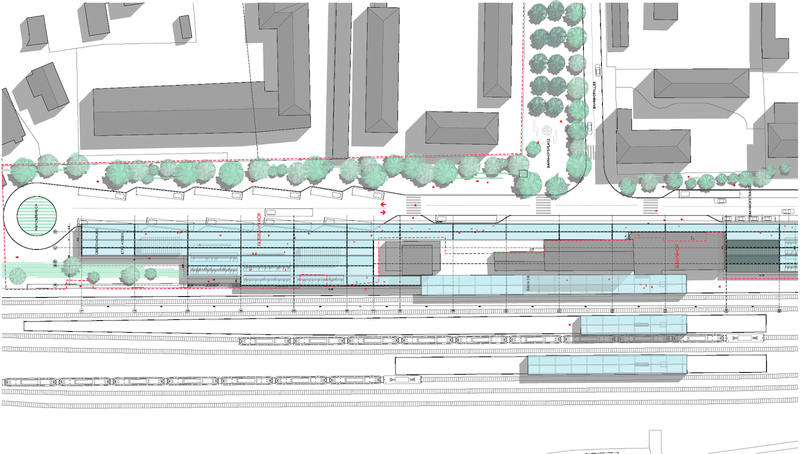 The complex of the Railway and the new Bus Terminal and its associated structure is set to become the gate into Weilheim, and the surrounding fabric needs to be designed accordingly. The area is now characterized by an incoherent set of buildings, which have been built over time without paying attention to the identity of the complex. 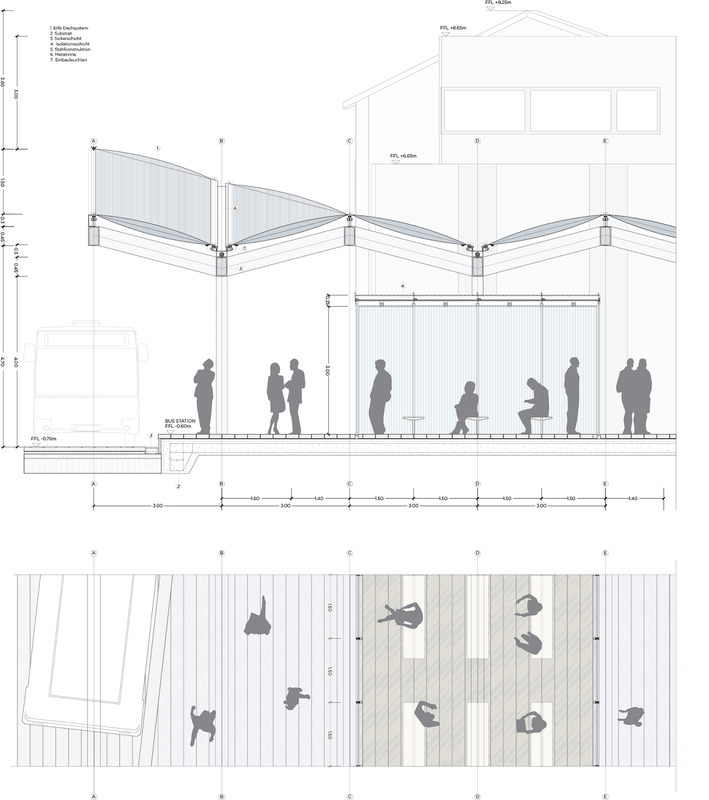 The construction of new canopies for the Railway Platforms and the new Bus Terminal offer a unique opportunity to provide a consistent architectural identity to the complex as a whole. 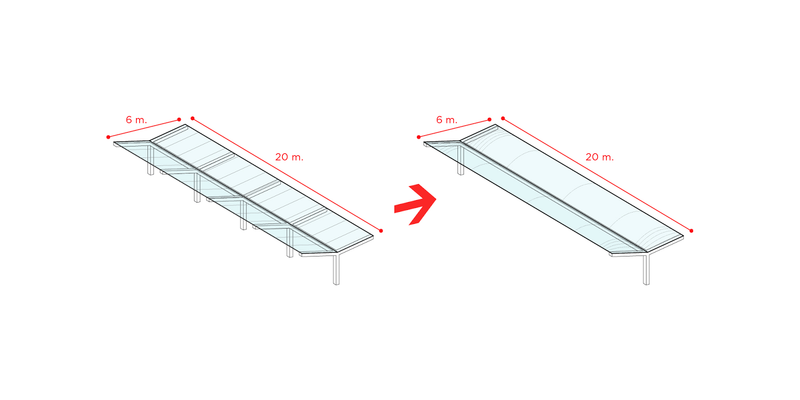 One of the most important elements of the new identity is the Railway Platform Canopies, which have been already designed using Y-shaped portals and glass plates. 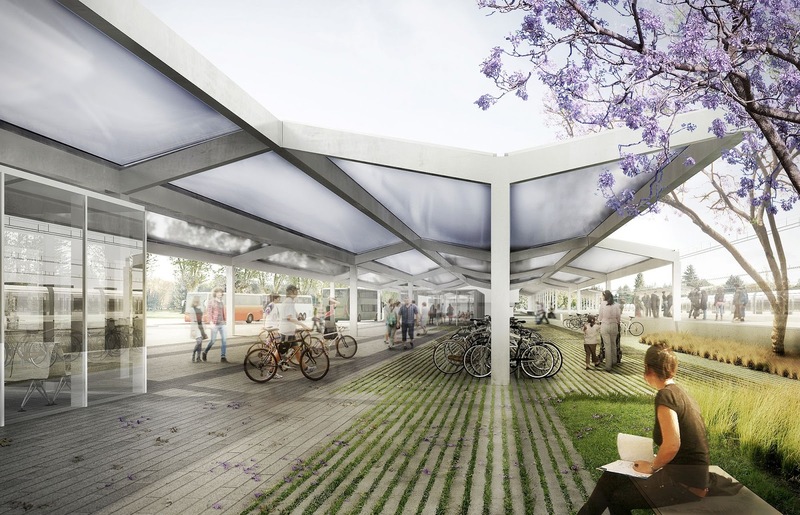 Our proposal is to design a system of Y-shaped, transparent canopies able to wrap around the different pieces of the transportation complex to produce a single identity. We have devised a system of ETFE canopies which will allow not only to keep the canopies transparent for optimal daylighting, but also to minimize the cost, and most importantly, the density of columns. With a technology using ETFE cushions of 3m x 20m, we have designed a structure of Y-shaped steel portals which is able to cover effectively the areas needed for the interface between the buses, the railway taxis and the bicycles, while enclosing the existing buildings in a consistent system, which will be able to provide an identity for the new Gate to Weilheim. 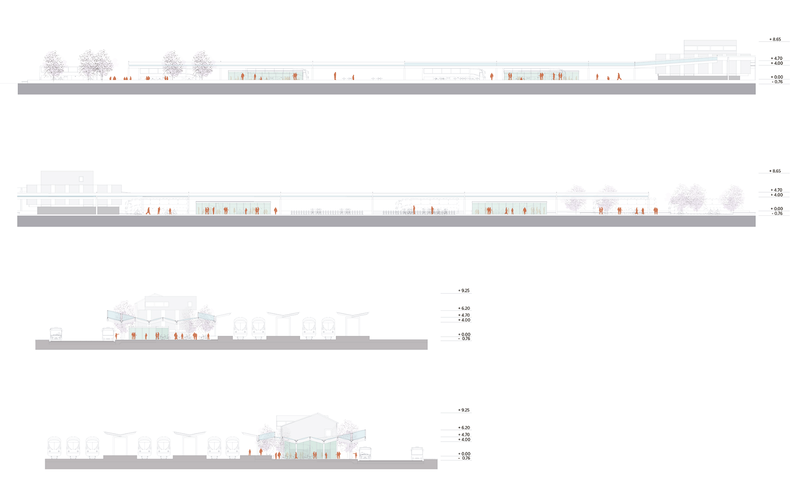 The proposal contemplates that the bus terminal will be located in the land north of the railway station. 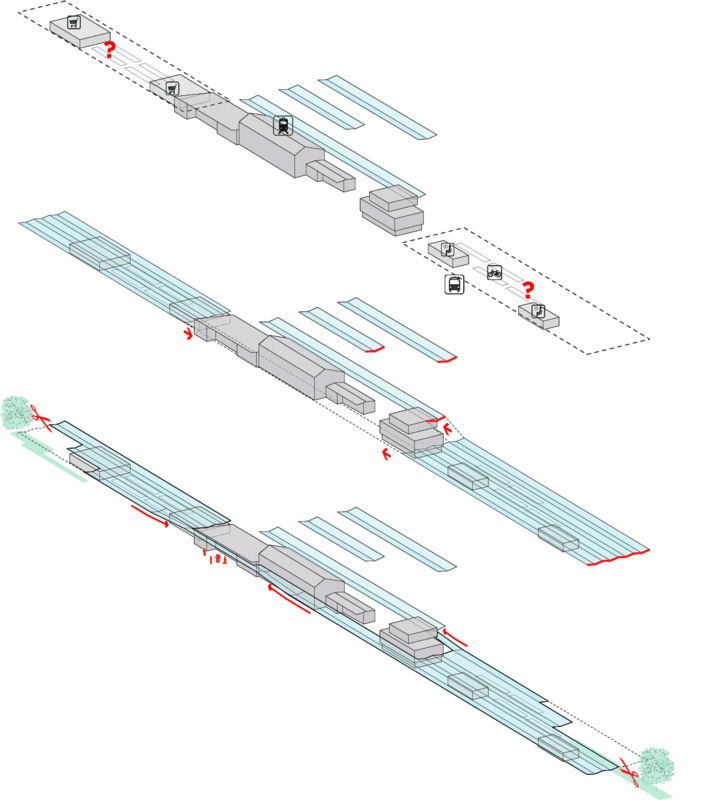 The Bus terminal will be organized as a loop as an extension north of Bahnhofplatz. Buses will drop off and pick-up on 5 docks on the station side and use the 5 additional docks on the Eastern side of Bahnhofplatz. The replacement buses will park facing the station entrance, on the Eastern side of Bahnhofstrasse. Alongside the station front we have located the taxi drop-offs. 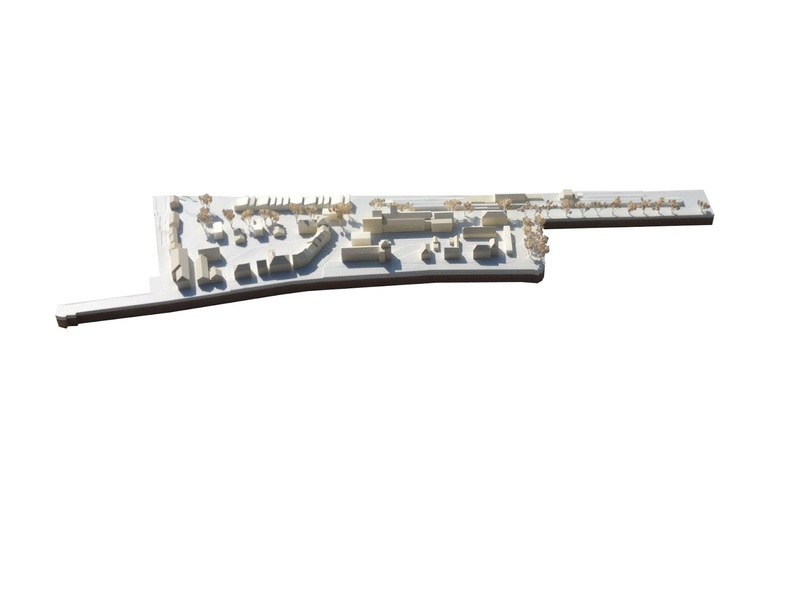 The Eastern side of Bahnhofstrasse is proposed as a linear park with a leafy canopy of seasonal trees, while the Western side, facing the stations, will be provided with a continuous portico which will ensure a continuity of cover across the main transport modes: rail, bus, taxi and bicycles. The canopy is the element that will provide unity to the whole complex. Made with steel box sections it is designed to allow for very large spans which will free the ground from structural elements. The height of the canopy ranges between 4,50 and 3,30 m ensuring an optimal protection from the rain. The ETFE cushions filling out the structure will provide lightness and transparency to the canopy, which is designed to wrap around the buildings, adjusting punctually its height in order to accommodate the geometrical specificity of the existing station. The ETFE cushions will be lit at night with LED Color Kinetics lamps which would allow the ETFE cushions to change color at will. The canopy will extend to the South side of the station, where we are proposing a second phase of construction which will add some complementary program: bicycle parking for 400 slots, and a specialized cycle repair shop, but also 360 m2 of retail facilities, opening onto an East-facing public space which closes the new facilities on the south end. The area will also be paved with grey natural stone which will be covering the whole area, including Bus Stops, railroad platforms, bicycle areas and taxi drop-offs. This continuity of the ground will contribute to the sense of coherence that we are after. 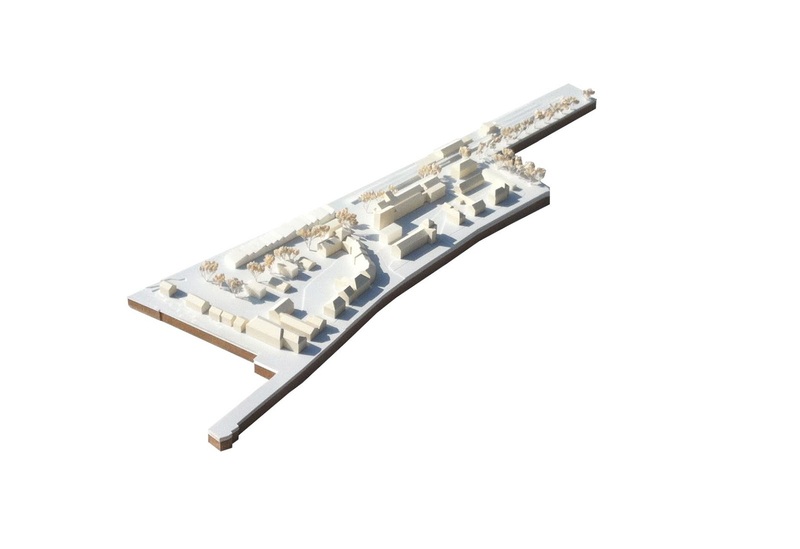 As a third phase to the development we believe there is a great potential to develop mixed-use functions close to the station. 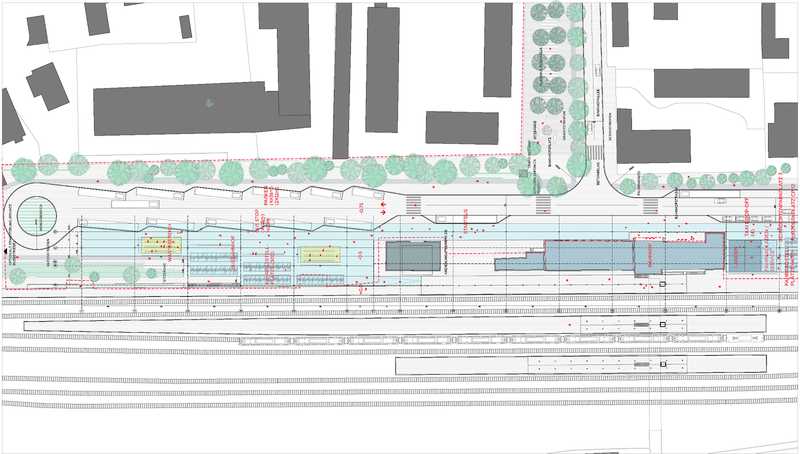 Further South along Bahnhofstrasse, when it turns towards Munchenerstrasse, we have located a pedestrian continuation to the Bahnhofstrasse which will allow only service access to the new mixed-use volumes that we are proposing to complete the railyard front, shielding the public space. 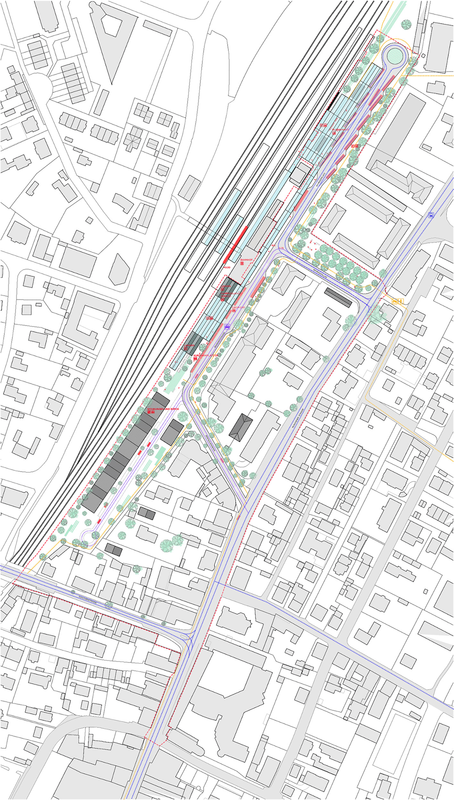 The addition of these additional spaces close to the station will intensify the quality of services in the station and densify the population of the area.